"I know what I have, but I'm not sure what it is capable of." This cliche sounds familiar isn't it? I belong to this category, and it is highly probable that many others share the same fate. Thanks to the internet and the many forums and blogs that information is freely available to those who want to know more about their gadgets and what they are capable of. If you have a Popcorn Hour C-200 (PCH-C200), there is more to the device than its intended purpose of being a Networked Media Jukebox (NMJ). There's more to the device than playing multimedia content -- it can download those too! Install. 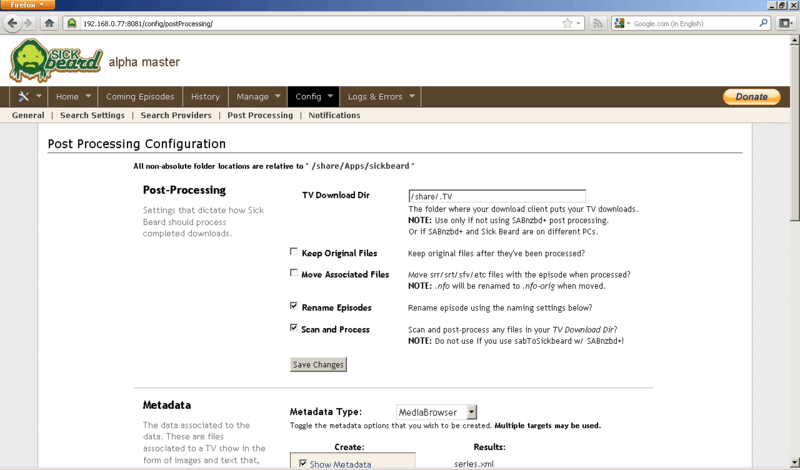 You would be interested to know that this software can automate the downloads of your favorite TV Shows. And this is done automatically without you having to do anything. All that it takes is to properly configure SickBeard, add your favorite shows, and watch your favorite TV shows on the C-200. For this install, you will be needing the Community Software Installer (or CSI). Under the Applications tab, select sickbeard and install it to the C-200. It is that simple. Configure. Now that sickbeard is installed, configuration has to be done. 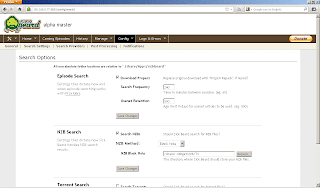 It is important that you point sickbeard to the right directories -- the directory where it will monitor the downloaded TV files and, (optional) if you are using the blackhole method, point it to the blackhole directories of NZBget (usenet) or transmission (torrent). Launch your favorite browser and point to "http://C200-IP:8081/home" (replace C200-IP with the IP address of your PCH-C200) and click on "Config". You can have several options here. The "General" tab is straight forward. Under "Search Settings", I ticked "Download propers". 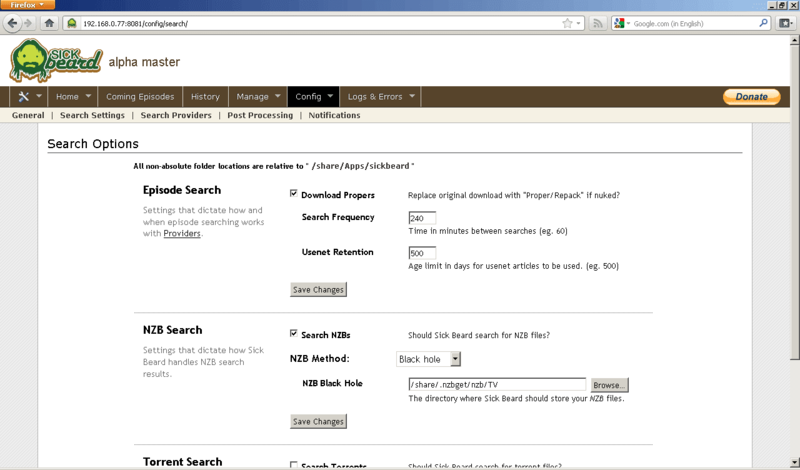 And from here, I also choose "NZB Search" using the blackhole method. You can also set sickbeard to download via torrent and put the blackhole directory of the transmission client. Next, configure the providers. Tick the providers that you want to utilize. You may change the order of the providers via drag-and-drop. Since I'm not really into backlogs, the "Sick Beard Index" and "Wombie's Index" are sufficient. Most of the other providers need subscription but if you have active subscriptions you may put the API keys in the appropriate forms on this page. Post processing is also important if you want to automate the renaming of your favorite TV shows. This part of the automation process is needed if you want to add episode titles. You may also configure how the renaming would appear, including the separators and season folders. A word of caution in this part of the configuration, tick the box corresponding to "Keep Original Files", until you are really sure that SickBeard works or once SickBeard functionality has been tested. Once "Keep Original Files" is unticked, post processing of downloaded files will delete or clean-up all of the other downloaded files and will retain only the .avi or .mkv file. This box comes ticked by default, so no need to worry. The directory named in this part of the configuration is the directory where transmission or nzbget will download the files to. This is not the directory where your TV shows will be stored permanently. Think of it as a bucket where you will temporarily store the downloads -- sort of the "blackhole" folder of SickBeard. With all the configuration done, it is time to add shows for SickBeard to download. Under the "Home" tab, is where you can "Add Shows". When adding shows, you are also asked where the episodes will be stored. Give this the path to folder where you want the episodes to be stored after post-processing. This should be a different directory than the "blackhole" folder above. The addition will trigger SickBeard to search if any of the providers have indexed the added show, and you can see if SickBeard has downloaded the appropriate file (nzb or torrent) to the appropriate download client. Also, you can view SickBeard logs from the web interface or on the C-200 itself. And aside from that, you can check if the TV show is scheduled to be aired soon. Further tweaks can be done on the SickBeard installed on the C-200. Check out the "Notifications" tab under the "Config" menu and configure the notification options. SickBeard takes care of the TV shows, but for Movies the equivalent software is CouchPotato. And the installation of CouchPotato is what we will outline next.